The most frequent request I get from swimmers is: “I just want to be able to breathe easy”. This is for good reason, since clearly if you rotate to breathe and inhale more water than air this will completely interrupt your stroke, anxiety and frustration sets in preventing the swimmer from progressing. The key is to integrate an easy breath into your stroke – not interrupt rhythm and change body position to gasp for air. We are humans after all, we breathe with the top of our head higher than our chin 99% of the time. Put us horizontal in water and the instinct to lift the head and rotate more is how a human is driven to breathe in an aquatic environment. The more we rotate the less stable the body is and begins to sink. The higher the head lifts, the more the hips (and chin) sink. That’s no secret, just physics. Lifting head and rotating more to breathe instinctively triggers the lead arm to push down and legs to splay wide to maintain stability. Once air is found and face is back in the water, body position resembles nothing like freestyle and looks more like the Flying Spaghetti Monster (FSM). Breathing like this on two’s (every other stroke) you may as well be a Freestyle Spaghetti Monster – drag profile increases exponentially, effort and the need for a lot more air. In order to breathe easily, head and spine must be in alignment, body needs to be level – or more precisely characterized in TI and is priority #1 – “Balance”. It’s counterintuitive, really counter-instinctive to keep head low and rotate less to easily find air, and both are central to seamless breathing. Timing is critical too. If breath is late and/or long, human FSM instincts will take over. Allow the shoulders to do the timing. When rolling to breathe, chin should follow shoulder to air. Empty the lungs when rolling to breathe to allow for immediate inhale when nose and mouth breach surface. If you exhale and inhale after mouth breaches surface, the breathing cycle is too long and you will be sucking on more water than air. Also, if breath is late or has slight hesitation on body roll (i.e, chin doesn’t follow shoulder to air), similar to the “long breath” you will only find more water than air. Breathing in the Bow Wave: When rolling to breathe, keeping head low and aligned with spine the water in front of your head will be higher and lower near your chin. I refer to this as “the pocket” or “finding the pocket” near chin which allows for an easy breath. A more scientific definition of the “bow wave”, select this link: Bow Wave Physics. In the illustration, notice swimmer is: 1. 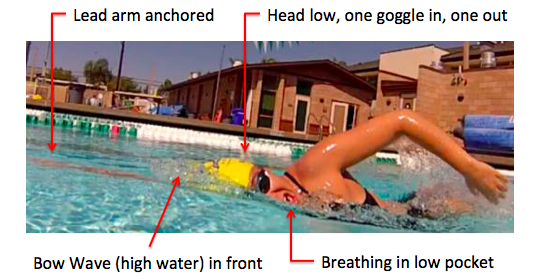 Stable, rotated just enough to get air, 2. head and spine are in alignment, head is low with one goggle in and one out, 3. chin follows shoulder getting a full breath (inhale) early in low pocket as recovery arm exits water, and 4. lead arm is anchored in front holding clean edge at breath – pulling not required. This swimmer is not altering stroke, rhythm or body position to breathe – thus maintaining balance, a low drag profile and forward momentum. 1. Remove the breathing component and practice the timing first by lifting one goggle above the surface. Take a few long strokes, then when ready/stable, chin follows shoulder until one goggle breaches the surface. In TI this is called the “Whale Eye”. Once you see air (with one goggle! ), return head back to neutral position – “goggles down”. Peeking one goggle above the surface allows you to feel the head and spine in alignment, head doesn’t need to lift to to see air. In shallow lanes, take a few strokes peeking on two’s or every other stroke. When you need air stop, stand up and breathe and repeat the “Whale Eye” process. 2. Once you feel confident and comfortable peeking one goggle above surface, head and spine in alignment (no lifting of head), now bring in the timing of exhale. As chin follows shoulder to peek one goggle above the surface, exhale continuously and quickly emptying lungs. Done correctly, you will feel the ending last burst of air on exhale clearing the way when mouth breaches surface and return head to goggles down without inhaling air. Stop stand up get a full tank of air, repeat the goggle peek and timing of exhale. 3. Now integrate the new position head and spine alignment, timing of exhale and try to take a breath in. But first, start off with three to four strokes keeping head neutral (goggles/nose down), then on next stroke peek one goggle (no breathing), on the next stroke after goggle peek, exhale as chin follows shoulder to air and quickly inhale (in low pocket) when mouth breaches the surface. However – if you find more water than air when trying to inhale, LET IT GO and try to breathe again on the next stroke. If no success getting air on either stroke, stop, stand up and breathe – repeat the “peek first then breathe second” process. Your mission is to break the instinct of lifting head, rotating more to breathe and discover the low pocket where easy breathing happens. The air is the same five inches above the surface as it is at the surface. Breathing in freestyle really is overrated. It’s only us humans adding instinctive movements and complexity that make breathing much more difficult and overly frustrating. Our mouths are not located on our foreheads, lifting the head will not get us more air, only lowers the chin below surface making it more difficult to breathe. Once our human, land based instincts to breathe have been removed is when you will find that stable, easy breath in the low pressure pocket of the bow wave. Whether swimming in calm pool or in lumpy open water conditions, the breathing position and process remains the same. Learning to breathe easy in freestyle takes time, be patient and trust the process. The air is free, take all you need. In my eyes a very helpful overview enabling to improve breathing skills thanks to detailed descriptions and background information given. combine training of balance (the basis for breathing) and streamlining with sufficient time to focus on the removal of human breathing instincts as body movements in the drills are still quite easy to control. The argument I have heard made for exhaling slowly is that your body is like a seesaw. Your abdomen — where your lungs are housed — will rise because your have ample air left. Which will cause your feet to fall and also make you kick harder and fatigued eventually. Thanks Lloyd. Your hips and feet will fall WITHOUT enough air in lungs. Yes, our bodies are like a pendulum that pivot about the lungs; balance and learning to shift more weight in front of your lungs will bring hips to surface without kicking exhaustively. Air to the back helps avoid excess concavity in the lower back. the lengthening of the ribcage and the free falling of top ribs and breast bone. A bonus is wider tracks for the arm. Ah. I’ve always had to pause and take a long arm recovery on my breathing stroke because it seemed to take a long time for my head to get above water. Reason would be because I exhale continuously….thanks so much. When I practice “Whale Eye” water is getting in to my nose – should I be exhaling in step one or is that happening because Im lifting my head? Im new to swimming and breathing is the hardest part for me. Lots of great information but the beginner’s question is simply: is it okay to breathe only on one side? how often – every stroke? That’s what we are used to and if it’s wrong we need advice on how to change, at the beginner level. Thanks. Wow for years I have struggled.. these exerises helped me enormously.